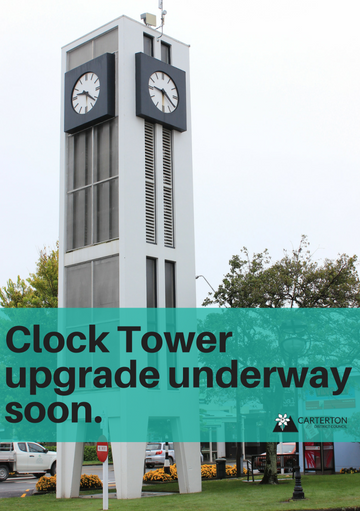 The iconic Carterton Clock Tower will soon undergo required earthquake strengthening works. The work, scheduled to take place in the next few months, will mean some disruption to the site and in particular the silencing of the clock tower bell. Carterton District Council Planning and Regulatory Manager Dave Gittings explains that the remedial team will take the opportunity to give the clock mechanism some much needed maintenance. The clock tower is a significant land mark on the Carterton landscape and any ideas to enhance its character are always carefully considered. As part of the project two trees will need to be removed. Dr Gittings says removing the trees is unfortunate but necessary. The tower will also receive a fresh application of paint.